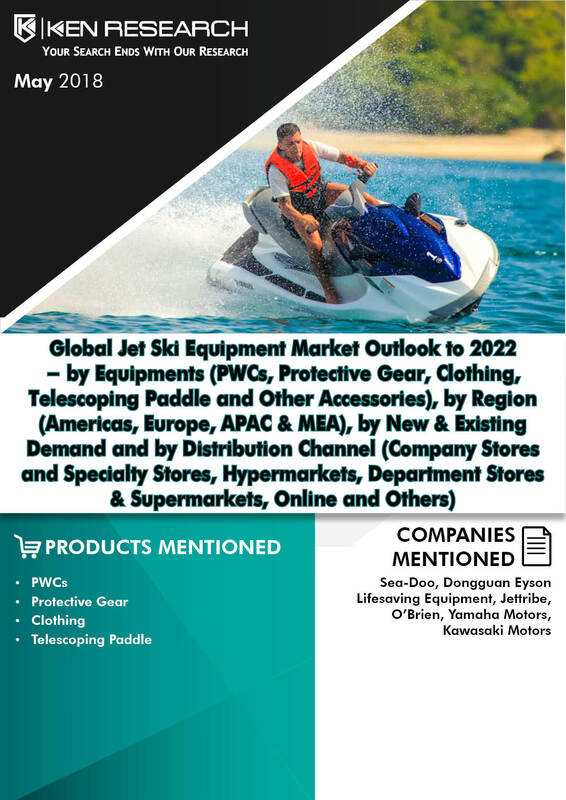 The report provides a comprehensive analysis of Global Jet ski Equipment market introduction, market size, value chain and market segmentations by Equipments (PWCs, Protective Gear, Clothing, Telescoping Paddle and Other Accessories), by Region (Americas, Europe, APAC & MEA), by New & Existing Demand and by Distribution Channel (Company Stores and Specialty Stores, Online, Hypermarkets, Department Stores & Supermarkets and Others). The report extensively covers competition scenario, market share and competitive landscape of major players including sea-Doo, Dongguan Eyson Lifesaving Equipment, Jettribe, O’Brien, Yamaha and Kawasaki, SWOT analysis and analyst recommendations. Analysts at Ken Research in their latest publication “Global Jet Ski Equipment Market by Equipments (PWCs, Protective Gear, Clothing, Telescoping Paddle and Other Accessories), by Region (Americas, Europe, APAC & MEA), by New & Existing Demand and by Distribution Channel (Company Stores and Specialty Stores, Hypermarkets, Department Stores & Supermarkets, Online and Others) – Outlook to 2022” have anticipated that owing to the sustained efforts towards better brand & product marketing by rafting equipment manufacturers and rising popularity of rafting as a professional sport in different regions will aid the global jet ski equipment market. Rise in technological advancements & innovations by leading market players have led to the evolution of this sport into a much safer and controlled event. Technologies like iBR, iTC, speed-limiting systems and engine enhancement are being adopted, contributing in making the sport more people friendly. This has and shall continue to attract major recreational as well as professional audience. US is the market leader in terms of manufacturing and consumption demand of jet ski equipments worldwide. Major players operating in the region include Sea-doo, Kawasaki, Yamaha Motors and Jettribe. These players would dominate the competition landscape even in the forecast period due to higher investments done towards new product launches and brand marketing activities. Owing to the rising popularity of the sport and its inclusion in various worldwide sporting events most notably in the recently concluded Asian Games 2018, the popularity of the sport is set to rise. Supported by the growing popularity of the jet skiing as a sport and rising awareness among people regarding the health benefits associated with jet skiing, the global Jet Ski equipment market is expected grow at a CAGR of close to 12% during the forecast period 2018E-2022E. The presence of large number of water bodies across the world would be prime sites for jet skiing activities in future. The market is expected to be dominated by the regions including Americas & Europe owing to growing participation rates and health concerns. In the recent years the APAC region is also witnessing an increase in the participation rates. The rising interest in recreational activities is expected to drive the market forward. Moreover, major manufacturers usually release new products in their niche markets, which usually comprises of countries such as the US, Canada, Italy, Spain and others. With the passage of time, more people have been opting for jet skiing professionally. This has given rise to increase in the number of Jet Ski championships and tournaments. Americas has been a major hotspot for such events. For instance, the P1 Aqua X Championships is the most important rafting competition in the Americas and Europe. The International Jet Sports Boating Association (IJSBA) oversees these championships and works in collaboration with the local governance. These championships not only help the countries at selecting its international competitive team, but have also helped the countries develop proper infrastructure to help the growth of the sport. Hence, these events encourage youngsters to opt for jet skiing as a profession and would thus, help the market to grow further in the forecast period. Spreading awareness across the regions like APAC and MEA regarding water tourism by the national governments and tourism operators/boards, would lead to an increase in the inbound tourism rates. These inflating tourism rates shall be a major positive influencing factor for growth in the rafting equipment market. Various countries including Japan, Thailand, UAE, Kenya, South Africa, Cambodia and Indonesia have excellent jet skiing sites. With rise in tourism, rental stores supplying jet skiing equipments and jet skiing camps would further mushroom. High cost of the PWCs is expected to raise the preference for rentals during the forecast period. The rental stores are expected to gain popularity among the people as they offer additional services like professional advice in choosing the PWCs for the customers. This may attract the amateur customers who do not frequently engage in jet skiing. The report provides a comprehensive analysis of global rafting market introduction, market size and market segmentation by Equipments (Protective Rafting Gear, Rafting Accessories & Inflatable Rafting Boats), by Region (Americas, Europe, APAC & MEA), by New & Existing Demand, by Distribution Channel (Company Stores and Specialty Stores, Online, Hypermarkets, Department Stores & Supermarkets and Others) and by Equipment Price. The report covers introduction, value chain and market size on the basis of consumer expenditure, market segmentation by Equipments (Surf Board and Surf Gear & Accessories), by Region (Americas, Europe, APAC & MEA), by New & Existing Demand and by Distribution Channel (Company Stores and Specialty Stores, Online, Hypermarkets and Others).